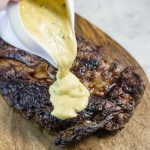 Rich and buttery, Bearnaise Sauce is perfect for the keto diet and to top a juicy steak. The sauce takes a little extra time to cook, but it’s well worth the effort! Place a small saucepan over medium heat, add the vinegar, wine, peppercorns, and onion. Reduce until 2-3 tablespoons of liquid remain. Strain out the onion and peppercorns and pour the liquid into a heatproof bowl. Add the egg yolks. Melt the butter until the milk fat (white liquid) has separated from the yellow butter. Set aside. Place the bowl over a saucepan of simmering water and start whisking. Continue to whisk until the mixture is thick and foamy and creates thick ribbons when the whisk is lifted. Remove the bowl from the heat and slowly pour in the hot butter while whisking, ensuring that the milk fat is left behind. 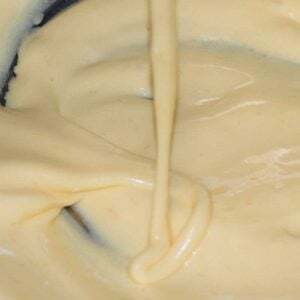 This step is similar to making mayonnaise - if you add the butter too quickly the sauce will split. Whisk in the salt, pepper, and tarragon. Serve immediately or keep warm until needed.